The National Credit Union Administration’s approval allows a new field of membership to the credit union which will encompass all of Franklin, St. Lawrence, Clinton and Essex Counties of New York, as well as in Vermont. MASSENA -- SeaComm Federal Credit Union was approved by the National Credit Union Administration to expand into Essex County and three counties in Vermont. SeaComm board chairman Myron F. Burns, along with president and Chief Executive Officer Scott A. Wilson, announced that SeaComm was approved for a new charter expansion at the end of fourth quarter 2017. The charter change was granted by the National Credit Union Administration, which is the credit union’s federal regulator. 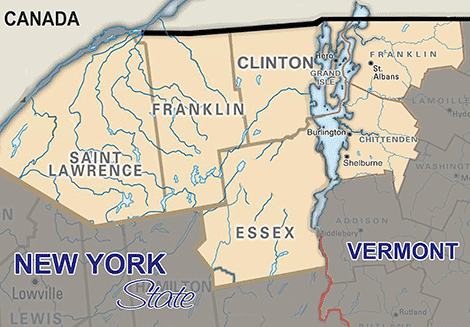 “We are confident in the new markets of Essex County, NY and the three counties of Vermont in which we will be serving; while at the same time ensuring it makes absolute sense for the credit union, and that our service to our current members will remain at the highest level that they have come to expect from us,” Burns said in a prepared statement. Headquartered in Massena, Seacomm has over $540 million in assets, and currently serves 45,000 members through a branch network that includes six full-service branches, administrative offices located at its headquarter building, shared branching and ATM networks and 24/7 ActivEdge automated teller machines, according to a news release. “SeaComm continues to evaluate the markets in and around the areas in which we currently have retail branches,” Wilson said in the statement. “We are extremely pleased to expand into four new counties of Essex County, NY, and Grand Isle, Chittenden and Franklin Counties in Vermont, as granted to us by NCUA. “Our Board of Directors are continually evaluating market conditions, as well as long-term opportunities afforded to the credit union in order to meet our strategic goals. Recently, we expanded into Plattsburgh, NY, which provided us insight into a vibrant, growing regional economy just across Lake Champlain and south of us into beautiful Essex County." Seacomm has not yet determined where they will build. They will be able to provide deposit and loan product offering and electronic services, including e-account opening and mobile branch to those living in the new areas of expansion. “We will remain focused on providing the highest level of quality service to our current membership, while ensuring we remain financially viable by continuing to diversify our expanded footprint,” Wilson said. Seacomm was founded in 1963 by 10 employees of Chevrolet Aluminum Foundry at GM Corporation. This will mark the second charter change for SeaComm in the last three years, as Seacomm opened a Plattsburgh location last year.